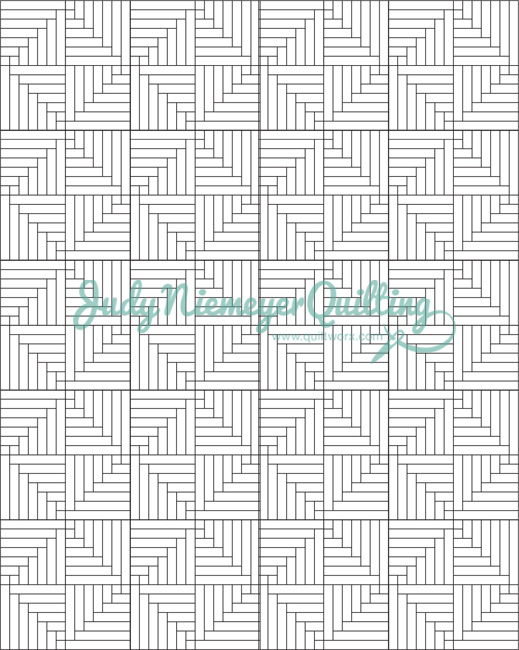 Redefining the way we make log cabins, this pattern is the first in a very long line of paper pieced log cabin quilts by Judy Niemeyer! Why paper piece a log cabin, you ask? Well, the answer, quite simply is speed cutting, speed piecing, and unbelievable accuracy! 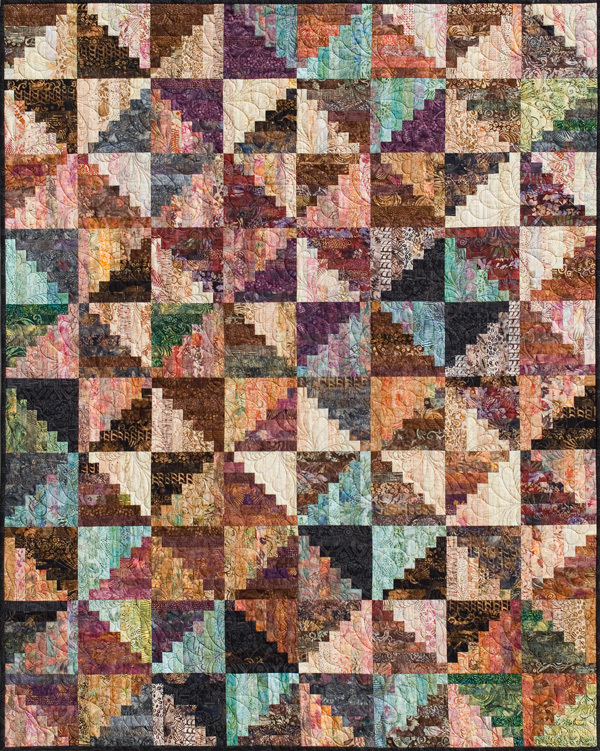 If you love Log Cabin Quilts and have made more than one in your life, we urge you to check this one out! You won’t regret it! Anna Miner I really like your quilt! Connie Danielson Even more beautiful in person! Judy Gagliardo I love the combination of colors !!!!!!! Log cabin is my favorite block !! Elaine Salisbury Good ol' Log Cabin. Split Log Cabin, Quiltworx.com, Made by Janet Spinks. Linda Wattnem Wow, love the look of the colors in this! Darlene Mac Love the colours! 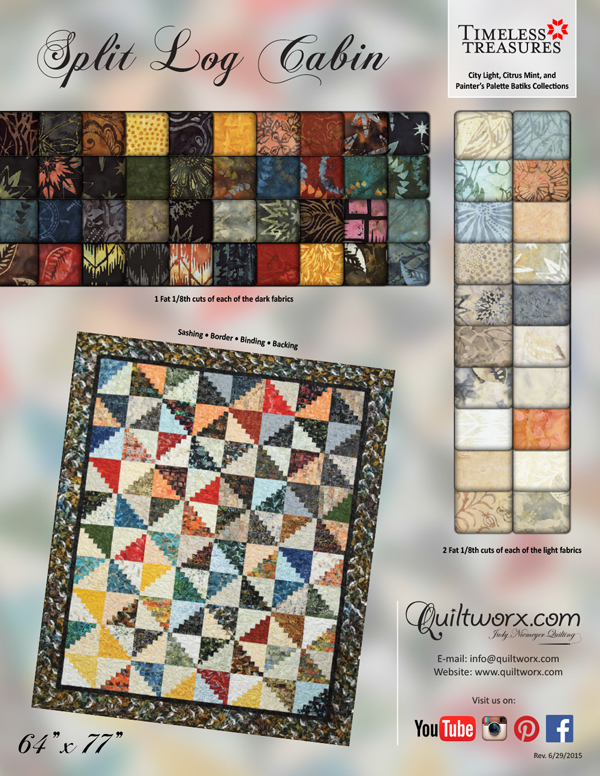 Another BEGINNER quilt created with our three new Batik Collections! This design uses all three batik collections in one quilt! It requires 1/8th Yard cuts of all the darks (a total of (40)), and (2) 1/8th Yard cuts of all the lights in the collections (a total of (20))...All (60) batiks are used in one design, for a fun layout in a great beginner project! Borders and Sashing are extra. Additional Kitting Information and some great photography of this design will be provided soon! Patterns available now. :-) Timeless Treasures Fabrics, Inc.
Cassie Marshall Judel will you all be labeling your patterns as beginner, intermediate and advanced now? (Or have I missed that they are already labeled like that 😊). I see so many people that want to paper piece but are intimidated. Split Log Cabin, Quiltworx.com, Made by CI Victoria Johnson. Diane Mitchell I saw Victoria's SLC hanging in Country Cloth Shop yesterday in Angels Camp. Even prettier in person! Split Log Cabin ~ designed by Quiltworx.com, made by Natalie Scott......Check out this little cutie in Reclaimed West! It's the Split Log Cabin! For details on how she did the fabric and ordered it in, go visit our Quiltworx Support Network Group on Facebook! Suzan Giles-Harrington Love love love!!! Split Log Cabin, Quiltworx.com, Made by Kelly Kroon. Virginia Lizano Very very nice. Melissa Tasker Connelly So pretty! Thanks for sharing! Marie Bowman WOW is right!! Jule Ann Smith I LOVE this ! Lisa Atkins Are theses quilts for sale? Split Log Cabin, Quiltworx.com, Made by CI Cindy Myers. Split Log Cabin, Quiltworx.com, Made by CI Jane Reents. Page 8-Fat quarter, and quarter yard amounts were adjusted.